1 Year Limited Hardware Warranty. 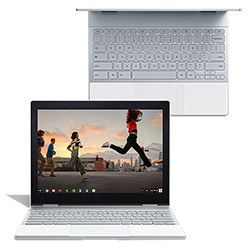 Also includes: Chrome OS, Intel HD Graphics 615, 802.11 a/b/g/b/ac + Bluetooth 4.2, Dual Band 2.4 & 5 GHz, 2x2 Wireless Driver, Backlit Keyboard, and a 41WHr Battery. A signature confirmation will be required upon order delivery. Hardware orders can only be shipped within the contiguous United States. This is a special order item. Please allow up to 2 weeks for order processing. This product is available for purchase by students, faculty & staff of SDSU with a current RED ID, and is not intended for resale. Eligibility will be verified during order fulfillment.